Following a cremation, there is a decision to be made regarding the final resting place of the ashes. They can either be interred (buried) in a churchyard, cemetery or on private land, or scattered on land or water. It is also possible to have some ashes placed into a keepsake or made into glass or jewellery. However, these options will only use a tiny portion of the ashes and therefore the remainder will need to be laid to rest. 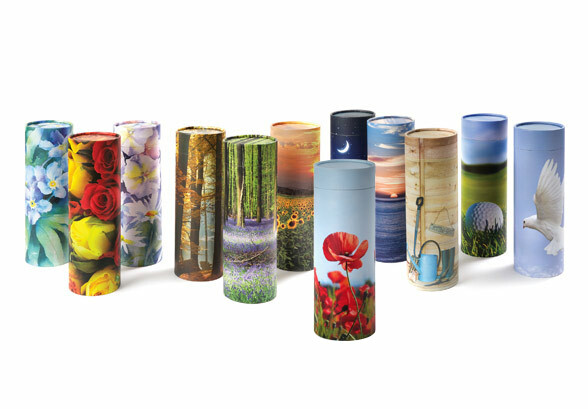 There is a huge range of ashes caskets and urns available including wooden, willow, ceramic, metal and various bio-degradable eco-friendly options. Some of these can be seen via the links on this page. We also stock cardboard scatter tubes, which come in a range of plain colours or picture designs, with personalised versions available to order. Whatever you decide, we can help and advise you, and make the necessary arrangements based on your wishes.